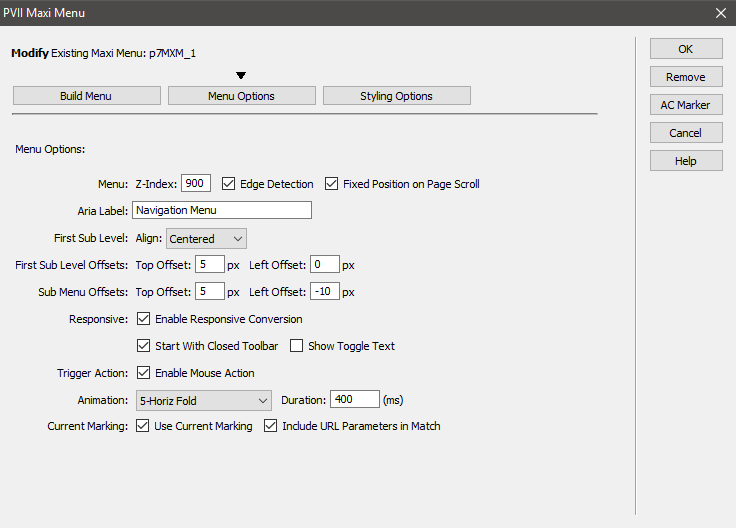 The MXM user interface, which installs into Dreamweaver, gives you near-total control over the look and behavior of your menu. You can colorize each component: the root container, the root links, and the sub-menus, individually, using easy to understand color keywords. Are you a serious coder? Well, this is your menu, too. Our code is squeaky clean and unobtrusive. You can set your own CSS classes on the entire menu and on each and every link, giving you the control you crave. And what about accessibility? Well, we provide full Aria and logical keyboard support. Everything has been considered. 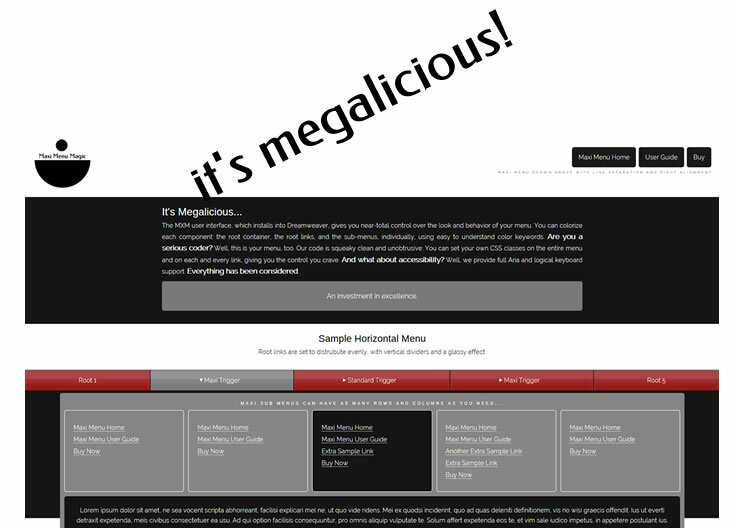 Maxi Menu Magic is Megalicious! An investment in excellence. The MXM UI is has 3 main tabs, giving you an uncluttered space to Build you menu, set Options, and Style your menu. I already have Horizontal Mega Menu Magic. Why should I consider Maxi Menu Magic? Maxi Menu Magic is Flexbox-based. That is, it will always look great, even if your root links do not fit on a single line. Maxi Menu Magic allows for the creation of both horizontal and vertical menus! 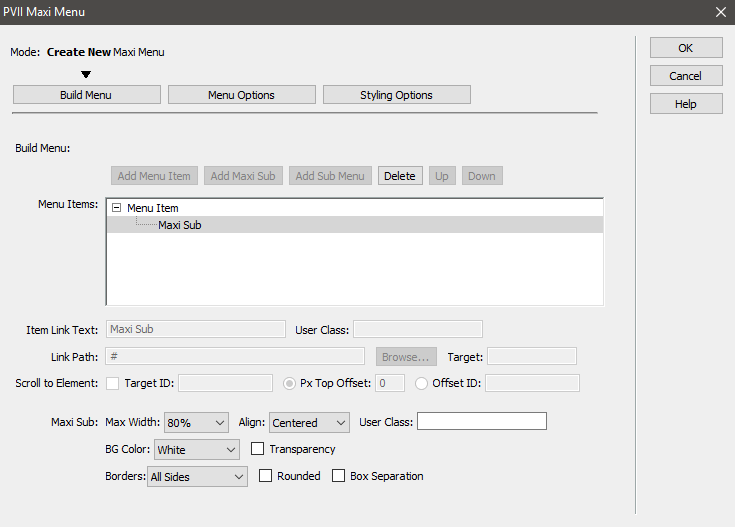 Maxi Menu Magic comes with a full Layout Manager for configuring your Maxi (mega) sub menus! MXM supports the Aria web accessibility standard. MXM supports smooth scrolling to any element on your page, making it a breeze to design single page sites or special-purpose pages. MXM allows you to choose a color set for the root menu, the root menu items, and the sub-menus. In all, this gives you thousands of color combinations. MXM also allows you to set colors for individual menu items. Automated User Interface -Quickly and easily create a fully functional Adaptive Menu with no coding required! Modifiable at any Time -Quickly modify the menu items and all options of the menu at any time. Add, remove, or re-order the menu items at any time! Fully Adaptive - Flexbox-based CSS ensures a clean look at all times, even when your links wrap. Root menu items can be conventionally aligned (Left, right or centered) or distributed evenly to fill the available screen. Mobile Device and Phone support -Automatically converts to mobile-friendly Hamburger-driven menu. Unlimited Sub Menu Levels -Add as many sub menu levels as you like. Maxi Sub Menus (mega-style menus) are Flexbox based and come with a special editor, allowing you full control over row/column configuration and styling. Simply right-click inside a Maxi Sub to launch the editor! Easy user interface-based Styling options allow you to set the styling for root menu, root menu links, and sub menus with just a few clicks. Optionally set rounded corners, borders, or transparency for the root menu, root links and sub menus directly in the interface! Integrated user Class Support -Each menu item includes support for custom class names. 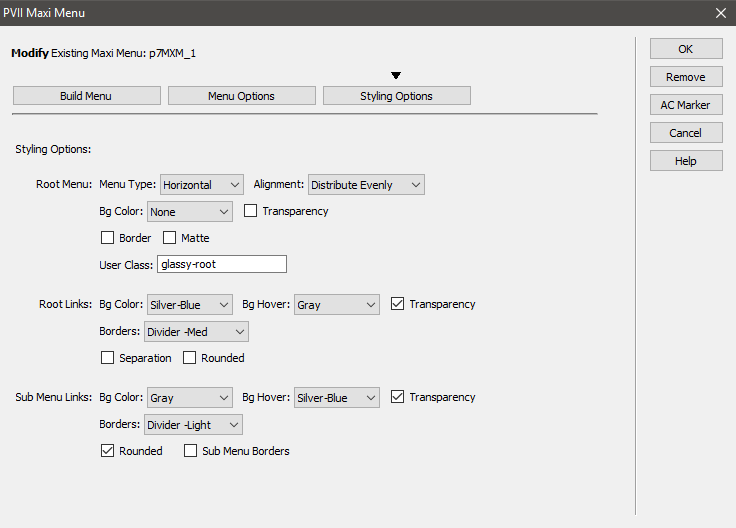 This allows you full freedom to customize individual sections beyond the options in the UI. Stylistically, there is absolutely nothing you cannot do. Smooth Scroll to Elements on Same Page -Any menu item can be set to scroll to the relevant page position. Fixed Position on Scroll Option - When the menu is scrolled to the top edge of the window, it becomes fixed so that it is always in view. Automated Window Edge Constraint -Assures that the sub is fully in view within the browser window edges. Aria Accessibility Support -built-in support for Aria. Auto Converter for Existing AMM, PMM3, PMM2, PMM1, DMM, LBNAV, jQuery, Bootstrap, and simple unordered lists. Measured against other menu building tools, Maxi Menu Magic simply has no equal. PVII tools make Dreamweaver better.